Are your trying to validate your business idea or maybe even trying to identify your target customer? 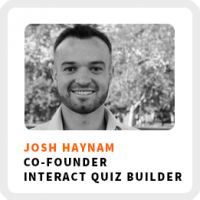 Josh Haynam shares how to build your community using quizzes. He saw a glaring hole in the way his web development and marketing clients were acquiring new leads. He used that opportunity to pivot his business to focus on it exclusively, helping him recently pass the million-dollar-mark in revenue. Josh is a co-founder of Interact Quiz Builder. He helps his clients target and engage their ideal customers by providing them with the most relevant content and information. How to build your own operating structure. Feel more fulfilled by working directly with the people your work is helping. Get unstuck by talking to people. Learn how many people Josh says you need to engage to validate your idea. Superpower: Taking an idea, running with it, and not stopping. Favorite productivity tool: Time blocking. Peak hours per day: 8, broken up into chunks. 90-day goal: Write at least 45 blog posts. Reach out to people who have done it and ask for their advice and experiences.